My brothers jungle hammock from his 3 year stay Vietnam. I'm also a backpacker so I already have a couple good tents. I've got a Mountain Hardwear Optic 3.5 and a Big Agnes Copper Spur 3. Both are great for 2 people. Nice setup, looks very comfortable! It is and can withstand the high winds of Wyoming and the heavy rains of anywhere else. It is great when you are spend a week in an area. The past two summers I have hit the road for 6 and 8 weeks or more at a time. This is a home away from home. Just adding a note: mine is the Eureka Apex two man. The earlier model with two “wings, no enclosed vestibules. Would like the vestibules but that model came out after I bought mine. Mine is every bit 15 years old, maybe a little more, and I to would add, like others have, that getting a two man for one person works great having the little bit of spread out room. Also allows the gear to come inside, out of sight out of mind and one less worry security wise. I do use “seam seal” on all stitching every couple years and take great pains to see that it gets stored dry! The cost at the time I bought it was about $100.00 so the annual cost is really low, plus it’s still rock solid. Just traveled out West last August, 7,000+ miles in 3 weeks with no complaint. With the rainfly off it’s mostly screening so great visibility but the fine mesh, while keeping critters out does cut back on the airflow some. Packs small 5x18 so carry’s easily on the bike. This model is no longer availible but “Sprink” on the forum has the newer model of it and is quite pleased. 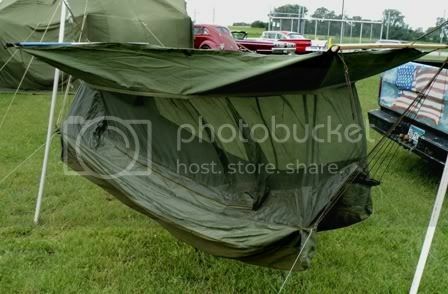 I use a USMC surplus 2 man combat tent. It is easily the best tent I have ever owned. 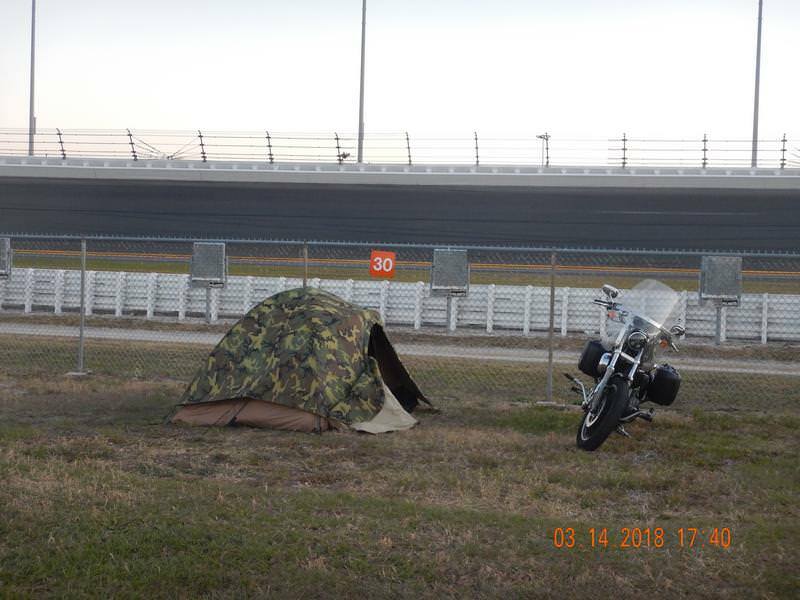 This was at Daytona Speed Week, last March. Eureka Timberline was the first tent I've ever moto-camped with back in the '80's. Heavy but unbelievably sturdy. I think the cheapest and lightest one I've found is a tarp with a tyvek bivy sack. Full fly waterproof tents are big bucks. Now I just get a throwaway tent and put it next to the bike with a tarp over everything. The tarp is suspended over the bike and tent so the tent doesn't have to be perfect. Keeps me dry and warm in motorcycle weather (I don't do below freezing any more.) If it's still in good shape when you get home keep it for next time, if it's beat up just give it away or donate it. We go with friends to nature on motorcycles. My wife with our son rides by car, she has a supply of food, a tent, sleeping bags. We used to use double tents, recently we bought a tent for 10 people. It's quite convenient, we put one tent and there is enough space for all. I have been searching for information on the Internet for a long time, I found a good review on hikezone. We chose Columbia Fall River 10 Person. Pros - two rooms and enough space for things. Cons - when it is very windy, the tent loses its shape. I like that the tent is waterproof, good ventilation, but when it’s very windy it’s uncomfortable. We rarely ride in the rainy season or strong winds, so I'm still pleased with this purchase. But next time I will choose more carefully.